Win4D Advance is a new generation advance 4-D analysis program. Design with the future in mind. A tool you must have to play smart and win better. This is the Windows version program with latest technology C++ laugange. Win4D Online is not an ordinary 4D result program. It is a complete analysis tools. Best of all, it is FREE! You can do a lot of analysis from the statistic table provided. Summary of System 1D to 4D. 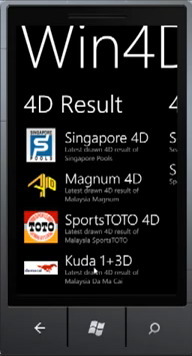 Win4D Online for Windows Phone 7 is not an ordinary 4D result program. It is a complete analysis tools. Best of all, it is FREE! You can do a lot of analysis from the statistic table provided. Win4D Standard is a direct 4-D analysis software. Program with the basic simple function for most 4-D player. Advise user base on direct number performances. You can use all the webtools online. You can use the Win4D Online on IPhone and Android phone FREE. You receive analysed 4D on your handphone vias SMS. You can join the elite player discussion in the forum. You can see our daily forecast 4D numbers. 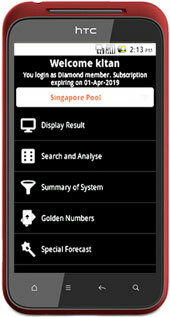 Gold members can see our special daily forecasted numbers. Winning 4D become reality.  1st Prize Direct winning! SMS services is currently free for everyone. To register, click the image below. This area shows the status of our SMS services performances. Those highlighted with Bold are direct hit otherwise, system hit. LiveSMS are updated immediately right after receiving from winners. No filtering are made. 4088 Yes n thank you.